In 2016, then San Francisco 49ers quarterback Colin Kaepernick controversially knelt during the national anthem before the start of an NFL game. In the wake of escalating civil rights activism that tailed events like the Pulse nightclub shooting and police brutality incidents against people of color that same year, Kaepernick’s actions generated passionate discussion across the nation. His actions caused many other players in the league, and even viewers across the nation, to get more involved in the discussion of civil rights and question if the United States was living up to its promise of impartial and fair justice. Whether it be refusing to recite the national anthem or the Pledge of Allegiance, Kaepernick’s kneeling caused the nation to undoubtedly refocus the discussion of what it meant to be American. Fast forward to 2018 and Kaepernick’s face returns as the starring role for the thirtieth anniversary of the Nike slogan, “Just do it.” which is accompanied by a new line of Nike products and a motivational advertising campaign. Just like in 2016, intense feelings spread like wildfire as, once again, politics spread into previously politically independent territory. Many dissenting voices were bitterly opposed to the advertising campaign, with many taking to social media to destroy their Nike apparel, Nike’s stock dropping a few percentage points, and mounting calls for a boycott. Those who disagree with Kaepernick’s opinion, or even just the idea of making sports apparel have political meaning, are quick to point out that they expect both the sport and the products they purchase to be separated from the politics of the sponsor. After all, consumers do not want to fund possible ventures by these companies that they morally, ideologically, and/or personally disagree with. In addition, from the perspective of the sport, Kaepernick’s record as a quarterback was generally regarded as middling and not outstanding, resulting in people with neutral feelings on the political issue suggesting more iconic athletes to head the campaign, like basketball star LeBron James, to avoid alienating consumers. However, similarly passionate were those siding with Kaepernick’s stance on being willing to sacrifice oneself or career for a nobler cause. A study by Edelman reveals that consumers are increasingly buying products from companies that have an agreeable stances on issues relevant to consumers, in this case, civil rights and core American values. Consumers guided by similar beliefs to Kaepernick have pledged to support Nike by purchasing more of their products and praising the corporation for taking a bold stance on uncomfortable issues. Furthermore, the younger and more liberal demographic of Nike seems to suggests that its target market will generate more revenue overall, resulting in the ad campaign being a possible financial success for Nike. In the end, the controversial move by the flagship sports apparel company may be a pivotal point in how companies decide to sell products in the future. For better or worse, it may become commonplace for companies to utilize politically charged issues to both build public relations and sell products as a result of this single campaign. However, successful public relation campaigns do not just state opinions, but they demonstrate. Here, Nike brought Colin Kaepernick back into the limelight and redefined what the iconic phrase “Just do it.” stood for. Tomorrow, it could be watershed efforts to rebuild towns, cities, and nations, whether selfless or not. 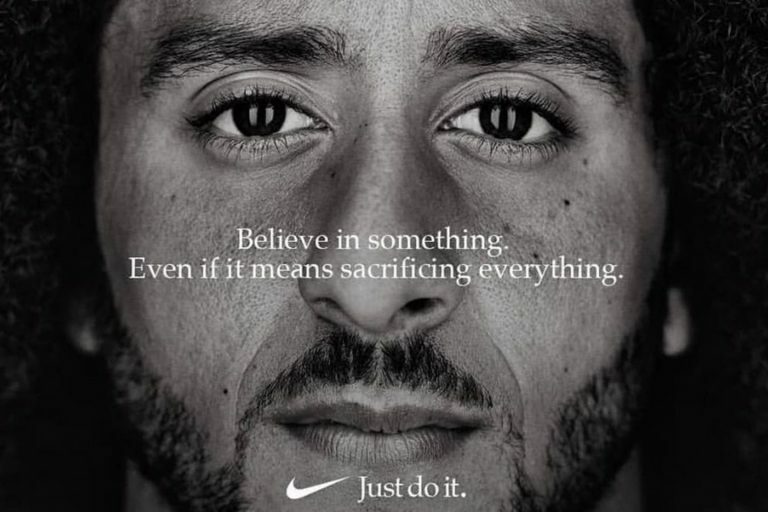 But one thing is not to be understated: this controversial campaign got the dinner table talking and, overall, the dollars flowing into Nike.